Herbert “Puschi” Puschmann was born on 10 Augsut 1920 at Bolkenhain in the Jauer region of Niederschlesien. Puschmann was posted to JG 51 in spring 1941. Leutnant Puschmann was assigned to 4./JG 51. He recorded his first two victories on 22 June, when he shot down two Russian SB-2 twin-engine bombers over the Eastern front. Puschmann was lucky to escape injury when his Bf 109 F-2 (W.Nr. 12 730) overturned on landing at Bobruisk on 7 July. On 31 October, Puschmann recorded his 10th victory when he shot down a Russian DB-3 twin-engine bomber. He recorded his 20th victory on 2 July, when he shot down a Russian Pe-2 twin-engine bomber near Dugino. Puschmann’s most successful month was August when he claimed 13 victories, including four enemy aircraft shot down on 5 August to record his 25th through 28th victories and his 30th victory on 12 August. He was wounded by bomb fragments during a Russian bombing raid on 3 September 1942. He had 37 victories to his credit at this time. By November 1942, Puschmann was serving with 5./JG 51 based in North Africa. 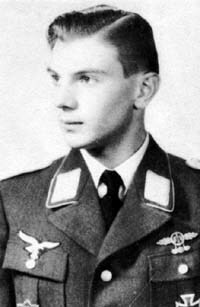 On 13 January 1943, he was appointed Staffelkapitän of 6./JG 51. Puschmann then led 6./JG 51 during the defence of Tunisia and Italy. He claimed three USAAF P-38 twin-engine fighters shot down near Kebili on 23 January (39-41). On 4 February, he shot his one and only USAAF four-engine bomber near Gabes (48). Puschmann recorded his 50th victory on 21 May, when he shot down an Allied P-40 fighter. On 3 February 1944, Puschmann engaged a formation of USAAF B-26 twin-engined bombers near Rome. He claimed one shot down for his 57th, and final, victory. Shortly afterwards, Puschmann was shot down and killed by return fire from the bombers, his Bf 109 G-6 (W.Nr. 160 767) crashing near Civitavecchia. He was posthumously awarded the Ritterkreuz on 5 April 1944. “Puschi” Puschmann was credited with at least 57 victories in 650 missions. He recorded 37 victories over the Eastern front. Of his 20 victories over the Mediterranean front were 9 P-38 twin-engine fighters.